Column vol.20 - race | Yamaha Motor Co., Ltd. The 1981 World GP season opened with fierce competition by rivals' intent on stopping "King" Kenny Roberts from winning his fourth consecutive GP500 title. 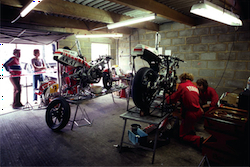 The force most likely to stop Roberts was the Suzuki camp, which had a number of highly able riders such as Randy Mamola, Marco Lucchinelli, Franco Uncini and Graeme Crosby. Suzuki's other weapon was its RGB500, noted for its dependable performance and reliability. While Honda's NR500 and Kawasaki's KR500 (in their third and second years respectively) were now highly refined, Suzuki went and introduced a new machine ― an even lighter and more compact RGΓ500, and immediately notched up a 1-2-3 finish in the first round of the season. In answer to this challenge, defending champion Yamaha simultaneously introduced the YZR500 (0W53) ― the final in-line four model ― and the square-four 0W54 with rotary disc valve intake. The battle for the title started from the early stages of the GP500 series, with Roberts winning the second and third rounds, and Barry Sheene achieving 3rd place in the third round. After this, however, Suzuki mounted a big assault with back-to-back victories in France and Yugoslavia and Yamaha's fortunes began to sink. In the rained-out Dutch GP, Roberts encountered some puzzling mechanical problems and was unable to start, while Sheene had water sucked into his engine and had to pull out of the race. In the San Marino round, Roberts suffered from health issues and was forced to withdraw, while in the British GP Sheene was caught up in an accident caused by another rider and had to retire from his home round. Amidst these woes, Suzuki's Lucchinelli and Mamola steadily racked up wins and opened up a big point gap on Roberts, who dropped to 3rd in the rankings. In that season of misfortunes the only bright spot for the Yamaha team was the 0W54's dramatic increase in power compared to the conventional piston valve intake, in-line fours. That year a V4 ― the next-generation in Yamaha engines ― was already under development and advance testing of the 0W54 rotary disk valve had also started. These factors led to the power gains. An engineer explained the situation in this way. "The rotary disk valve had been used on the race track since the 125cc and 250cc racers of the 60's. But there was a big risk in suddenly applying it to a 500cc V4 engine, so we decided to first collect data using a square-four engine, like Suzuki's." Yamaha knew, however, that they could not afford to finish the season on a losing note. It needed a race that would generate hope for the coming season. This goal motivated the whole team and brought results in the final round of the season, the Swedish GP. But the rider who recorded the best time of 1 minute, 39.54 seconds in the preliminaries and obtained pole position was not Lucchinelli (who was focused on the championship) or Mamola (seeking to make a comeback) but Sheene, fighting to win his first championship with Yamaha. However, the finals were lashed by heavy rain. It was Kawasaki's Kork Ballington who raced away from the starting line first but the race soon developed into a tight contest with the order rapidly changing hands. Eventually, Mamola was out of the race. Roberts also had trouble with a tire and dropped out of the battle, while Lucchinelli resigned himself to pursuing safety over speed. Then, on the 20th lap, Sheene judged that the timing was right and made his dash. He quickly took the lead and, while shadowing Boet van Dulmen on an in-line four YZR500, proceeded at a blistering pace to pull away from the pack. On the final lap, Sheene emerged from a close battle between the two Yamaha riders to finish 1st. The following year, the square-four YZR500 evolved into the 0W60 and dominated the opening round with 1st and 2nd places. In addition, the rotary disc valve was added to the V4 0W61 model introduced in the second round of the GP and demonstrated new possibilities for two-stroke GP machines. In three seasons with Yamaha, Sheene managed only one victory. However, that one win was an important one that confirmed and continued the 0W54's many successes.